Throughout the years, the topic of immigration has always served as a controversial subject as lawmakers, policy enforcers and public servants alike have sought resolutions to the consistent arrival of immigrants upon United States soil. Recently, the media has been exploding with pictures and videos of the harsh and overwhelming treatment of families seeking safety and asylum from their current living conditions in other countries. Despite the debatable procedures that have been in circulation, I, just like millions of other individuals, have been left shocked due to the cruel and immoral treatment of human beings. Since his inauguration, the 45th President of the United States has made outrageous claims and remarks about his goals to reclaim the sanctity of America by enforcing stern measures to combat immigration. Most historically, many of us were taken aback by his delirious sentiments to build a wall along the U.S.-Mexico border. In the time that has passed since those remarks, we became appalled at his lack of genuine care displayed toward minorities who have continued to be on the losing end of racial, social and judicial battles due to negligence from the society in which we live. Implemented in April 2018, the Trump administration’s “zero-tolerance” policy has served as an atrocious and unfortunately accurate display of a country that has allowed an ill-fitting individual to promote his inhumane and uncompassionate agenda to the masses. Since the Trump administration put the policy into effect, it has separated an estimated 2,300 children from their families, according to the Department of Health & Human Services (HHS). Recently, HHS requested the Pentagon, one of the world’s largest office buildings and most well-known symbols of the U.S. military, to house 20,000 migrant children on military bases beginning in July until the end of the year. In response to the seething backlash his administration received due to the overwhelming sight of disconnected families, Trump performed a hurried stunt by issuing an executive order designed to end family separations by allowing them to be detained together while also retaining the administration's zero-tolerance immigration policy. Despite all the measures and publicity stunts the president and those in his administration make to distract citizens in the wake of this war against human rights, the reality still stands that the lives of black and brown people have been forever affected. If it wasn’t apparent before, it must indeed be clear that we now live in a nation that has exchanged the ideals of life, liberty and the pursuit of happiness for death, deceit and the deferment of dreams. As an American citizen with West Indian roots and grandparents who immigrated to America from England, I’ve realized that as much as I’ve been thankful for the sacrifices my family members made to provide a better future for me in America, I have also been privileged to the point of taking my freedom for granted. As a toddler, I remember getting separated accidentally from my mother in a store. Although lost for only a few minutes, it felt like hours isolated from my mother, the one constant I had in my life up to that point. Today, I feel my share of guilt as it serves as a nightmare to think of how traumatic it might be to be separated from my mother at a vulnerable and tender age without any knowledge of where she is or when I could expect to see her again. In a video excerpt courtesy of ABC News, Dr. Colleen Kraft, president of the American Academy of Pediatrics, emphasized the severity of this human rights crisis by outlining how the health of young infants and toddlers separated from their families can be permanently and negatively affected. For young children, the brain does most of its development from the moment they’re born until they turn three; as a result, enduring trauma like being separated from their parents and family members can severely impede their ability to be well-minded children, teenagers and adults. In addition to the executive order not calling for the reversal of the zero-tolerance policy, it’s evident there is no comprehensive plan in place to reunite the thousands of children already separated from their families. In the coming weeks, we should expect for the government to try tricking us into thinking that positive efforts are being put forth via visual and verbal depictions of families reunited with smiling faces and tears of joy. Don’t fall for it; it’s all a part of the political and media scheme. According to Axios, the Justice Department has been and is still criminally prosecuting all adults who are caught crossing the border illegally. Due to immigrant parents having to go through this prosecution period, the DOJ is requesting a judge modify a 2015 ruling stating child migrants can only be held in detention centers for no more than 20 days so children can be kept for more extended periods of time, if necessary. Furthermore, endless questions continue that the White House hasn't answered: What happens to adults who receive charges as a result of illegally crossing the border? What happens to the children if the federal judge doesn’t extend the 20-day holding period? Will there be a formal process established to reunite all of the children who have been separated from their families and already transported to sponsor or foster families or detention centers? It’s beyond unsettling to live in a country that has politicians who will continue to flip-flop their statements to please the temperament of the American people seeking answers as to why this injustice can continue. As social and civil justice journalist Shaun King wrote in a recent article, this current period of separation of families is a repeat offense of previous time periods and instances where African-Americans and Native-Americans have been forcefully split apart from one another with many never seeing each other again. What kind of country do we live in where Attorney General Jeff Sessions uses a Bible verse to justify an adherence of the law that separates children from the very people who birthed and raised them? What type of government are we depending upon where the Department of Homeland Security Secretary Kristjen Nielsen sidesteps every question and refuses to apologize for forcing migrant children into “tent cities” but then attempts to eat dinner at a Mexican restaurant? Even the first lady of the United States, Melania Trump, used this latest ordeal as another prime opportunity to showcase her lack of consciousness by donning a jacket with the words “I Really Don’t Care. 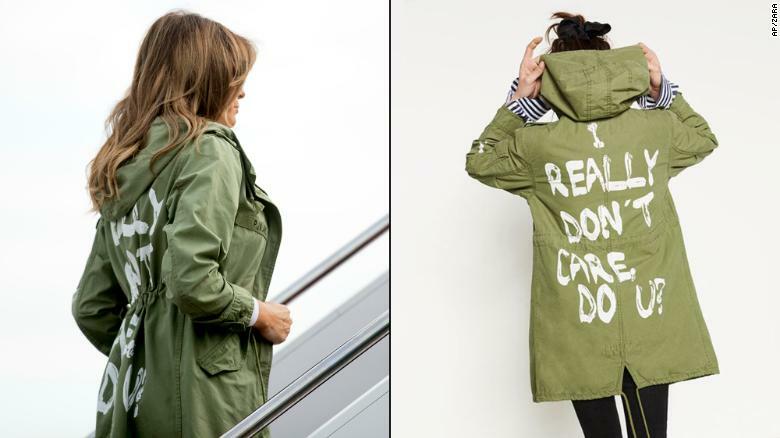 Do U?” written on it as she traveled to visit immigrant children at the border detention centers. Whether directed toward the media (doubt it) or about something else, it was stupid. Through all of this, we must internalize a shocking truth which is our country can be beautiful one moment and revolting the next. Since our elected and appointed officials won’t tell us the truth, we must say it ourselves: Due to the recent policy, some of the parents and family members of detained children will never see their children again. As you’re reading this, you might be telling yourself you don’t know where to start, or you’re not informed enough about politics to feel confident in your ability to take action. You’re wrong. We all can do our part to make sure our country doesn’t continue to lie about who we are and turns over a new leaf in the face of controversy. Better days are ahead; we must stick together to weather this storm. Are you interested in learning how you can help advocate against family separations? See below for more information on how you can take a step in the right direction. The most widely circulated effort being created to combat Trump’s zero-tolerance policy is SB 3036, the Keep Families Together Act. Today, do your part by dialing 202-224-3121, giving your zip code and stating your support of SB 3036. Additionally, take a few minutes to call your congressperson to express your dissatisfaction with the zero-tolerance policy. Although all Senate Democrats have already stated their support of the bill, you should make your request clear that you would appreciate your congressperson’s representation in opposition to family separations, regardless of your political party affiliation. To further help, the ACLU has a script you can follow here and will even route your calls to the correct representative. For more ways to help take a stand against the zero-tolerance policy, click here.